Probe • Suspect in seven killings claimed links to al-Qaida. 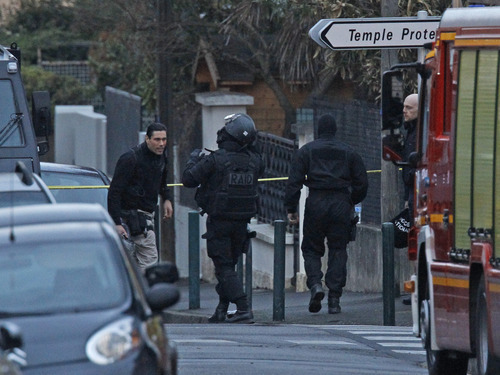 Toulouse, France • In a dramatic end to a 32-hour standoff, a masked French SWAT team slipped into the apartment of an Islamist extremist Thursday, sparking a firefight that ended with the suspect jumping out the window and being shot dead in the head. 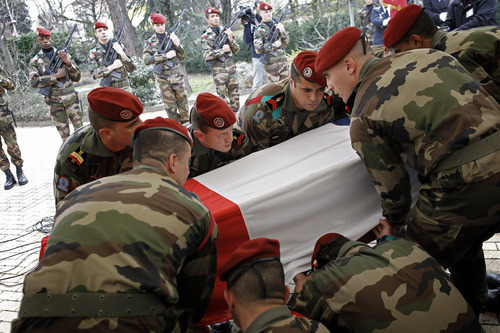 Mohamed Merah, 23, was wanted in the deaths of three French paratroopers, three Jewish schoolchildren and a rabbi  all killed since March 11 in what Merah reportedly told police was an attempt to "bring France to its knees." Police had been trying to capture him alive since a predawn raid Wednesday to arrest him at his apartment in the southwestern city of Toulouse. The killings he was accused of  and boasted about to police  have shocked France, ignited fear in moderate Muslims about stoking discrimination and may even affect the country's upcoming presidential election. 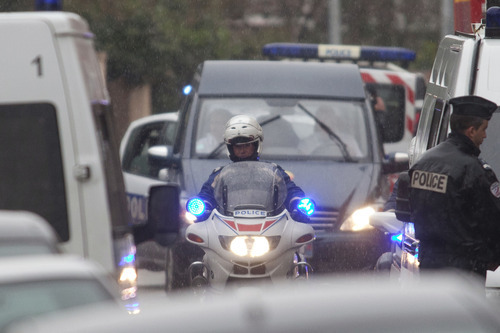 The seven slayings, carried out in three motorcycle shooting attacks, are believed to be the first killings inspired by Islamic radical motives in France since the Sept. 11, 2001, attacks. French President Nicolas Sarkozy, speaking in Paris, said an investigation was under way to see if Merah, a French citizen of Algerian descent who claimed links to al-Qaida, had any accomplices. A U.S. counterterrorism official says Merah was on the list of known or suspected terrorists who are prohibited from flying to the U.S. The counterterrorism official, who spoke on condition of anonymity to discuss the ongoing investigation, says Merah had been on the no-fly list since 2010. The list includes thousands of known or suspected terrorists. His mother and a brother were detained Wednesday by police after the mother's computer became a critical link in tracking Merah down. 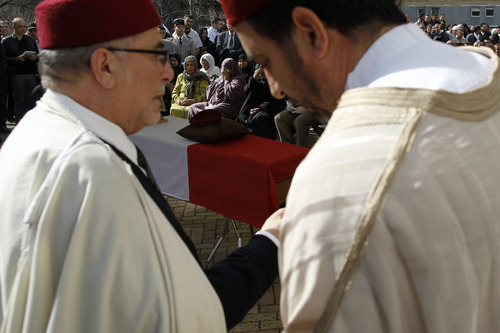 The brother Abdelkader had already been linked to Iraqi Islamist networks. The SITE Intelligence Group, which monitors Internet messages, reported Thursday that a lesser-known jihadist group was claiming responsibility for the attacks in France. SITE said Jund al-Khilafah issued a statement saying "Yusuf of France" led an attack Monday, the day of Jewish school shootings. There was no independent confirmation of the claim. Authorities said Merah espoused a radical form of Islam and had been to Afghanistan and the Pakistani militant stronghold of Waziristan, where he claimed to have received training from al-Qaida. He also had a long record of petty crimes in France for which he served time in prison. Merah told negotiators he killed to avenge the deaths of Palestinian children and to protest the French army's involvement in Afghanistan. After initially agreeing to surrender, Merah declared he would resist and that it would be either them or him. "If it's me, who cares? I'll go to paradise," Prosecutor Francois Molins quoted Merah as saying. Molins said Merah burst out of his bathroom when police gingerly entered his apartment Thursday morning, wildly firing his gun about 30 times before jumping out an apartment window. "(He) launches an assault, charging police through the apartment and firing at them with a Colt .45, continuing to advance, armed and firing, as he jumps from the balcony," Molins said. Merah fired "until he was hit by a retaliatory shot from the RAID (elite police unit), which felled him with a bullet to the head," Molins said, insisting that police fired in self-defense. It was not clearly exactly when he was hit by the bullet to the head. The prosecutor said police had gone in cautiously, using robot cameras to see if there were any boobytraps. Three members of the special squad were wounded Thursday, bringing the total of injured French officers throughout the standoff to five. Merah, lying on the ground below his second-story apartment, was wearing a flak jacket and black djellabah robe. A Colt 45  the type of weapon used in the three attacks  was at his side along with a sack, Molins said. Merah had made "extremely explicit films" of all three deadly attacks, video since viewed by police, and claimed to have posted them online, the prosecutor said. Merah told investigators where to find the bag with the videos, caught by a camera that had been strapped to his chest and given to someone else to keep. In the film of the March 11 attack that killed a paratrooper, the prosecutor said the gunman is heard saying: "You kill my brothers  I kill you." 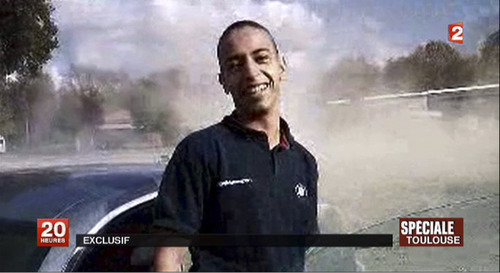 In his film of the second attack, on March 15 that killed two paratroopers and wounded a third in nearby Montauban, Merah cried out "Allahu Akbar!" or "God is great" in Arabic, the prosecutor said. 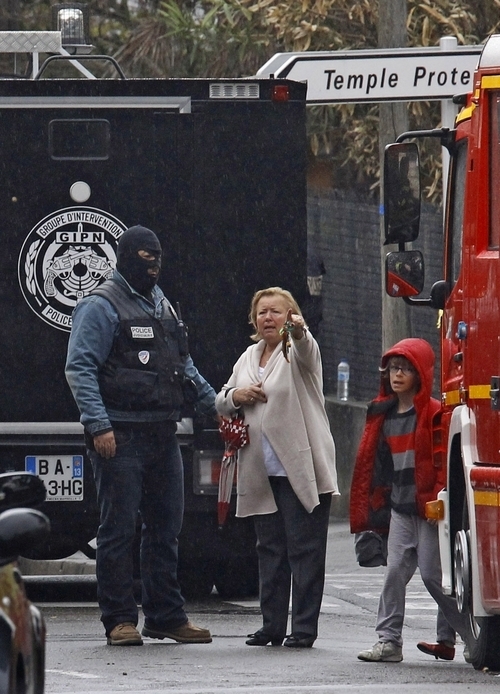 Authorities spoke little about the video of the third attack at a Jewish school in Toulouse. A witness to another video of that rampage, from a school camera, said it was chilling and had described him shooting young children in the head. A stash of arms was found in a car rented by Merah, including an automatic Sten pistol, a revolver, a pump-action rife and an Uzi submachine gun. Ingredients for Molotov cocktails were stashed on the apartment balcony. Inside, were three empty ammunition clips, a pot packed with pieces of ammunition and a Colt .45 with a near-empty clip. Merah had told investigators where to find the car. More than 200 special investigators had worked to track him down. They found his mother's computer, which he used to respond to an online ad posted by the first victim, a paratrooper trying to sell his scooter. They also found a Yamaha motorcycle shop where Merah suspiciously sought information about how to deactivate a GPS tracker. 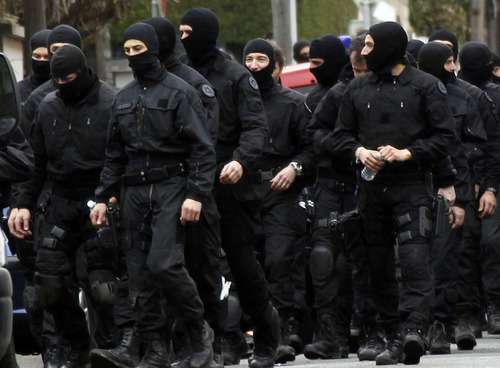 After the standoff ended, Sarkozy announced tough new measures to combat terrorism. He said anyone who regularly visits "websites that support terrorism or call for hate or violence will be punished by the law." He also promised a crackdown on anyone who goes abroad "for the purposes of indoctrination in terrorist ideology." The French president also appealed to citizens not to confuse violence with France's estimated 5 million Muslims. "Our Muslim compatriots had nothing to do with the crazy motive of a terrorist," Sarkozy said, noting that Muslim paratroopers were among those killed. The threat of radical Islam in France was apparently affecting the presidential race, in which Socialist Francois Hollande has long been the pollster's favorite to unseat Sarkozy, a conservative. 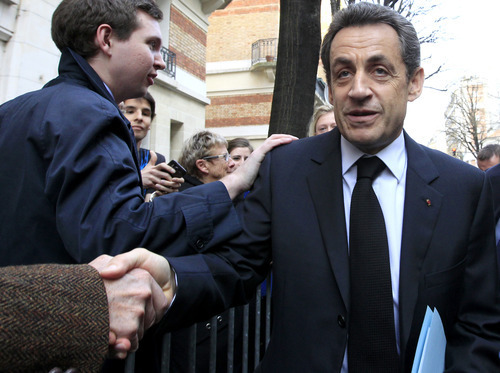 A poll released Thursday suggested that Sarkozy may benefit politically from the horror of recent days. The survey by CSA suggested Sarkozy would slightly dominate the first round of voting on April 22 but lose to Hollande in the May 6 runoff, by 36 percent to 45 percent. That was the smallest spread yet and the highest score for Sarkozy so far for polls by CSA in this campaign. The poll was conducted Monday and Tuesday, after the rabbi and three children were killed at a Jewish school but before details about Merah emerged. A total of 1,003 people were questioned by telephone. No-fly list • A U.S. counterterrorism official says Mohamed Merah was on the list of known or suspected terrorists who are prohibited from flying to the U.S. The counterterrorism official, who spoke on condition of anonymity to discuss the ongoing investigation, says Merah had been on the no-fly list since 2010. The list includes thousands of known or suspected terrorists. Claim to killings • The SITE Intelligence Group is reporting that a lesser-known jihadist group is claiming responsibility for three shootings in southern France that left seven people dead. The reported claim Thursday by Jund al-Khilafah, a group that has also claimed past attacks in Afghanistan and Kazakhstan, comes after Mohamed Merah died after a firefight with French police. 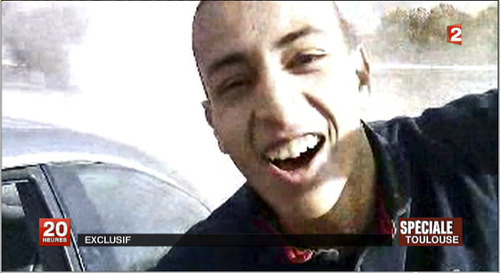 SITE, which monitors jihadist messages on the Internet, said the group issued a statement in jihadist forums saying "Yusuf of France" led an attack Monday, the day of shootings that killed a rabbi and three Jewish children in Toulouse. March 11 • A French paratrooper is killed by a lone gunman on a motorbike in the city of Toulouse. Authorities say the killer had responded to an ad the victim placed offering to sell his motorcycle. March 15 • Two French paratroopers are killed and one is seriously injured when a gunman on a motorbike shoots them at a bank machine in Montauban, 50 kilometers (30 miles) from Toulouse. Monday, March 19 • An attacker on a motorbike guns down three children and a rabbi at a Jewish school in Toulouse, France's worst school shooting and the deadliest attack on Jews in France in three decades. That night, police investigators tap the phones of the mother of Mohamed Merah, who had emerged as the chief suspect in the probe. Tuesday, March 20 • Schools across France hold a moment of silence to honor the school shooting victims. 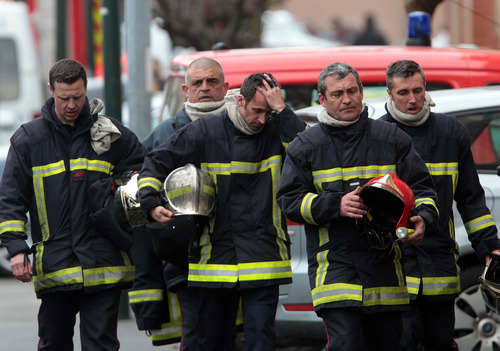 By afternoon, police trace Merah to an apartment in the Cote Pavee neighborhood of Toulouse. 10:00 p.m. • French officials meet, and within half an hour police decided to arrest Merah, his mother and his brother. 3:20 a.m. • Police descend on Merah's apartment. Police say he opened fire when officers arrived, shooting one in the knee and a second in his bulletproof vest. Attempts to arrest him are repelled by gunfire and a protracted standoff ensues. 8:05 a.m. • French minister says Merah has thrown a handgun out a window, but still has other weapons. 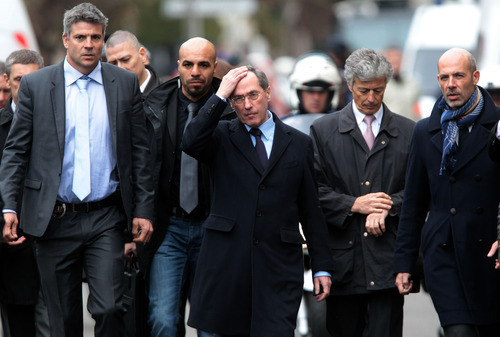 12:30 p.m. • French police resume negotiations with Merah. 1:05 p.m. • Police union official says Merah has promised to turn himself in the next hour and a half, otherwise police will force their way in. Merah reneges on his pledge but the assault doesn't materialize. Soon before 9 p.m. • Street lights cut around Merah's building to help police using night-vision goggles. 11:30 p.m. • Three explosions ring out from the building, accompanied by orange flashes of light  a tactic police say aims to pressure Merah to give up. 1:40 a.m. • Two new blasts and brief bursts of gunfire ring out at the apartment. Sporadic blasts are heard throughout the night at one-hour intervals. 7:10 a.m. • French interior minister says Merah wants to die "with weapons in his hands." 11:30 a.m. • Police gingerly enter his apartment through the door and the windows. As they arrive, Merah bursts out of the bathroom, shooting officers with his Colt .45 and diving out a window. Officials say later he was shot in the head. Prosecutor Francois Molins insists police acted in self-defense.